ALL LATHERED UP Soap Company is based in the Sacramento mountains of Ruidoso, New Mexico. Each handmade bar is carefully formulated to provide the ultimate in moisturizing under the harshest of conditions. 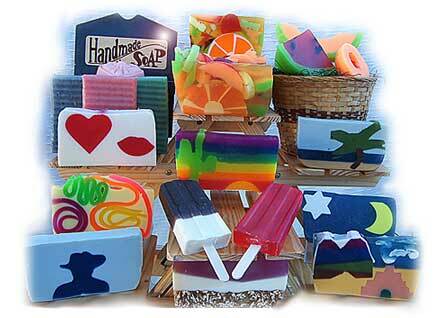 Our hand-cut soap is unusual and artistic. You'll find none like it. We use only the highest quality essential and cosmetic grade fragrance oils available on the market today. No animals are used in testing or production. Simply put, our products pamper your skin. Our 100% vegetable oil Glycerin Soap is extremely moisturizing, rinsing clean with no residue, fragrant & beautiful to behold. You will find no other Glycerin soap as artistically inspired. Each bar is a one-of-a-kind work of art. Once you've used our product you'll be hooked! Our long lasting Goat's Milk Soap is formulated with palm oil, coconut oil, olive oil, and real Goat's Milk. Goat's Milk is rich in proteins, vitamins and minerals - a truly pure, natural beauty aid. It adds a creamy richness to the lather and is very emollient. This is among the most luxurious soaps you will ever use. For all over nourishing natural sea salt scrubs, creams, bath salts, shea butters and silk shaving butters. Each one handmade with the highest quality formulations. Ruidoso.net - It's where to go!